about the somethinsomethins/fiber assortments: when i was a kid, i used to love the packages i got in the mail from the h.e. harris stamp company. i'd order the big bag o'stamps and when they arrived i loved seeing all the variety of postage stamps from around the world. with those bags in mind, i decided to create these fiber flava packs. 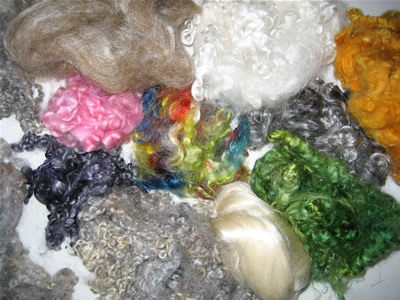 they're filled with special bits of exotic this + that for spinners and fiber artists to include in their drumcarding adventures, add to their yarns and just generally experiment with. choose from packages that are already made up, or make a special request! $25 + shipping for 3 oz of fun. NOTE: these fiber packages are one of a kind, and not reproduceable. 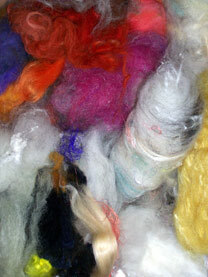 they're based on your color/texture requests, my mood of the moment and the fibers i have in stock. thanks for wanting unique things and the supporting the artists who create them!